after yesterday's ridiculously long, at times self-pitying, at times vitriolic, stream of consciousness... I thought I should perhaps keep this posting short and sweet. I still have so far to go, but the most progress really has been over the last month once I realised that I really needed to start taking it seriously! 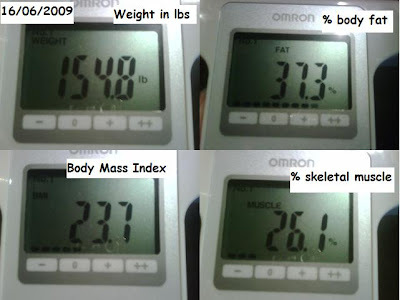 Also, an interesting thing has happened with my body composition. My weight is still stubbornly refusing to drop below the 11 stone mark, but my body fat has decreased and my muscle has increased - hurrah! 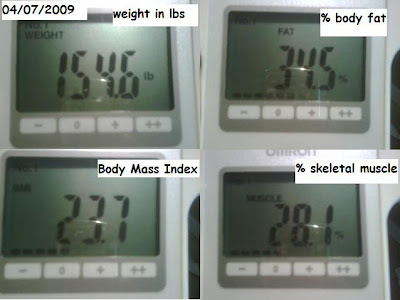 have a look at these two pictures, the first is of my scale readings taken on 16th June, the second was taken this morning - weight almost identical but body fat and muscle have changed a fair bit, quite surprising really, but also extremely gratifying :-)! WOW! You are looking great! Congrats... love the before and after pics! This is a great lesson in looking at things other than a weight measurement to see progress. You look more tightened & toned in your afters for sure. Congratulations on your hard work paying off! p.s. was reading your sidebar and your quinoa, spinach, tomato and minced lean beef sounds delish. Is there a recipe you can share? or do you just make it up as you go? Hi guys, sorry I haven't had a chance to update this until today.